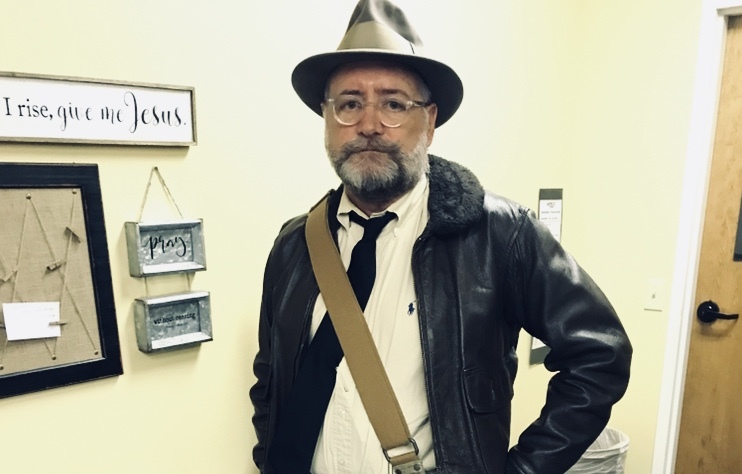 Mr. Wetterling portrays "Indiana Jones" for Meme day. Mr. Wetterling is sure to wear his neck tie as he portrays “Indiana Jones” for homecoming Meme day. One way our school stands out from any other is the remarkable relationship between students and teachers. A teacher at Grace Prep is not only a teacher, but also a mentor, a counselor, and a friend. Many students here say teachers have made an everlasting impact on them. One teacher’s name seemed to tumble off student’s lips readily when discussing teachers. -The man obsessed with neck ties. -The man who doesn’t call his students by name. -One of the wisest men we know. When I was a Sophomore and Grace Prep was just a prospective school, I shadowed a student for a day. That day I heard the name “Mr. Wetterling” more times than I can count. Mr. Wetterling takes the time to not only get to know every one of his student’s real names, but he also comes up with a unique, never-used nickname. Becoming a part of Grace my Junior year, I was unable to experience Mr. Wetterling’s class because he teaches Freshman History and English, but I was determined to get a nickname from him. For the first month or so of my Junior year, I begged Mr. Wetterling for a nickname every time I saw him. Every time he turned me down. “You’d have to be in one of my classes, sorry,” he would say. I made history as the first (and only) student to receive a nickname without taking one of his classes. I received the name “Pipes” thanks to my last name… Schmoker. Every nickname is so unique. Junior Zach Lester’s nickname is “Rocky”. Could it be because Zach likes the mountains? No. Maybe he’s a fan of the iconic movie series? Wrong again. Is it because he’s just really good at skipping rocks? Still wrong. While I could go on and on about Mr. Wetterling’s wacky nicknames, I’d like to speak on a more serious note and stress the personal impact he’s had on his students. Mr. Wetterling’s teaching style and personal interaction with his students has been testified to on multiple occasions, and hatred for English or History has been turned into passion. As well as insightful, Mr. Wetterling knows how to make class enjoyable. “No matter what mood I was in, the moment I walked into Mr. Wetterling’s class I was instantly in a better mood,” said Junior Sage Post. “Yeah, he always found some way to make us laugh,” added Junior Chandler Tolliver. To this day, I’ve never heard anyone speak of Mr. Wetterling poorly. Well, except for the homework load… But that’s a story for another time. Written by: Faith Schmoker on 10 October, 2018. Love it!! Well done!! Your words do describe our precious, Mr. Wetterling. May he continue to be a positive force for our children for many years to come. God bless you Mr. Wetterling and, Piper for writing this amazing piece.